Far from being a mere commodity, a product separated from the social and cultural dynamics of its production, pizza is food at the centre of a social ritual. It is at the centre of a koinè at the centre of which are the oven and the pizzaiuolo’s worktable. It is no coincidence that in traditional Neapolitan pizzerias ovens are not hidden; they are in the centre of the room, like an ancient fireplace. The pizza maestro does not have his back to the customers; he faces them and interacts with them at all times; there is a constant collective feedback. This initiates forms of community credit, such as the “today and eight” pizza, bought and consumed immediately, paid eight days later, or the “suspended” pizza, following the ancient Neapolitan tradition of the suspended coffee, which involves consuming one espresso and paying for two, leaving one in for less fortuned strangers. This form of generosity towards strangers, based on the assumption that “a pizza is denied to no one”, elects pizza, already the global emblem of street food, as the food of solidarity. This is one more piece of evidence suggesting we need to come up with new ideas, in order to face the crisis. Curiously the most innovative ideas are the ones born in the heart of tradition, from community welfare, with no bureaucracy or added costs. Typical of the people who smile in the face of adversity. Some might call it fair-trade margherita. Maybe it is just Neapolitan altruism. Given the global success achieved by this product and the degree of excellence reached by artisan pizzaioli everywhere, even outside of the country where this simple but delicious product was born and reached its popularity, one wonders why we would want to observe it with the rigour of a scientific approach. After careful consideration this choice might not appear all that strange. If one wants to look beyond the folklore, the empiricism, the clichés and false beliefs, the only way to do that is to understand why certain phenomena develop in one way rather than another, why some raw materials give rise to some results and others to different results, why slight differences in the preparation lead to pizzas with certain sensory characteristics rather than others. Understanding the relationship between the composition of raw materials and the behavior of the dough, the structure of the dough and the organoleptic characteristics of the pizza, is the only way for a pizzaiolo to understand how and when to intervene in order to reach the desired result or correct any mistakes. This will enable him to achieve complete mastery of the pizza making process, an art which has developed thanks to the practical experience of Neapolitan pizzaioli through centuries, and made pizza a local speciality. 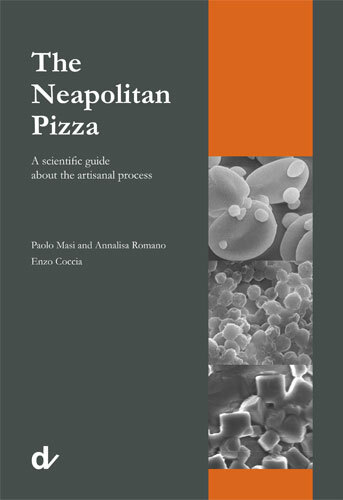 English translation of the book "La Pizza Napoletana"